A Kenyan Turkana boy’s dreams of racing his family’s camels suffer when his father sells them because of the rising price of water. Etabo and his siblings tend the family’s goats until another water price hike sends the older ones off to find work. Tending the goats alone, Etabo daydreams about racing camels. He even tries riding chickens, cats, and the stubborn goat Keti. When Etabo implores Akuj the Sky God for help, the answer returns: “Your dreams are enough.” His sister Akiru, observing Etabo’s increasing unhappiness, whittles him a gift of three wooden camels. 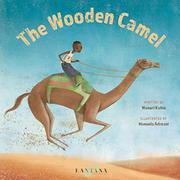 The toys fuel Etabo’s imaginative play and prompt nighttime dreams of winning a camel race. Akiru’s kindness fuels Etabo’s release from his frustrated desires, engendering imaginative play that’s right-sized for both his development and his family’s situation. Kenyan filmmaker Kahiu’s telling is simple and straightforward. She infuses the narrative with details from Etabo’s daily experiences, from the acacia tree where he rests to Akuj, to whom he prays. Italian illustrator Adreani’s mannerist pictures feature humans and animals with ultrathin limbs and delicate, stylized features. Akiru wears traditional beaded necklaces and silver earrings. Her sweet gift and Etabu’s appreciative hug are poignantly depicted.